…to play someone at chess. 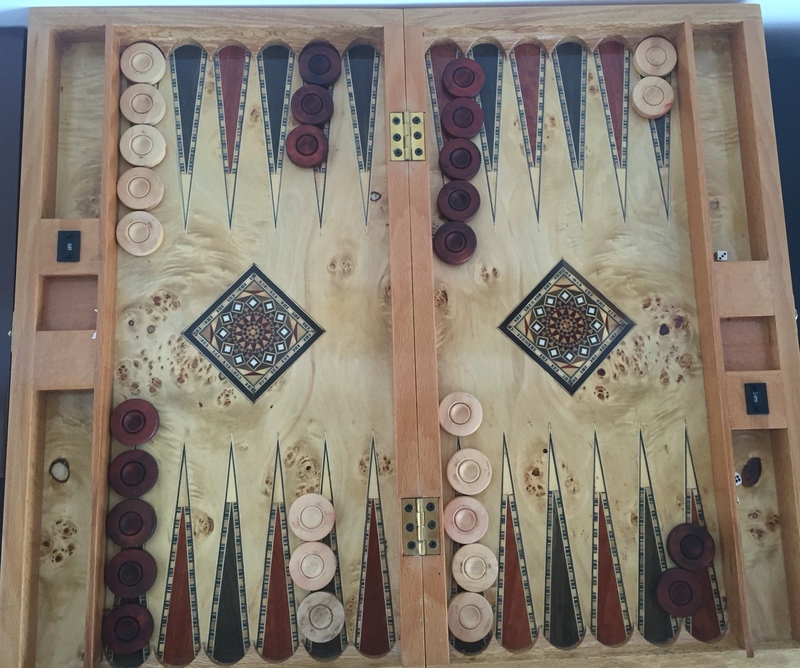 The local game is backgammon, with it being the norm to see men playing it at local bars; and there are always backgammon sets at beach clubs and on boats, and we have a lovely one for our guests to use at Sundown Villa. The other almost as common game is Okey, a dominoes type game, which I am told is principally chance. Again, on any walk round Kas you can see Turkish men playing Okey, with the rattle and clatter of the pieces, in their bars. The tourist shops are full of chess boards, mainly ornate ones, so presumably some tourists buy them. But I have never seen people playing chess in Kas, else I would have joined them and asked for a game. I have been on the look out for each of our nine visits. 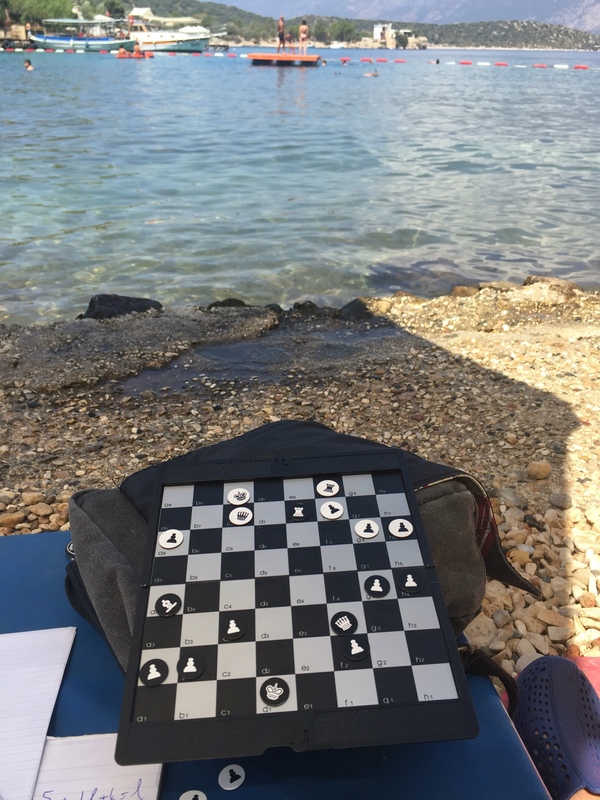 Yesterday, we were at our favourite beach, Nuri's, at Limanagzi, and for part of the time, I was going through an old game with an article about it. As Jane knows all too well, when I am studying chess, I am oblivious to the outside world. Sophie told me that the waiter kept looking and smiling each time he passed and saw the set. I hadn't even noticed him. Eventual he came back and crouched down by my sunbed, and we started a conversation. I asked him if he played chess, and he said he liked it very much. I asked him if he wanted a game, and he was very keen. We set the pieces up, and, of course, shook hands. Mert was a decent player: he played sensibly in the opening, a King's Gambit, but once in the middle game his position deteriorated rapidly, and eventually the game ended in a pretty checkmate. Several minutes later, Mert came back and asked if we could email him the pictures. From then on, for the rest of the afternoon, we had lovely friendly smiles each time he walked past on his round. A wonderful experience. Once again, by hobby has provided happy experiences.